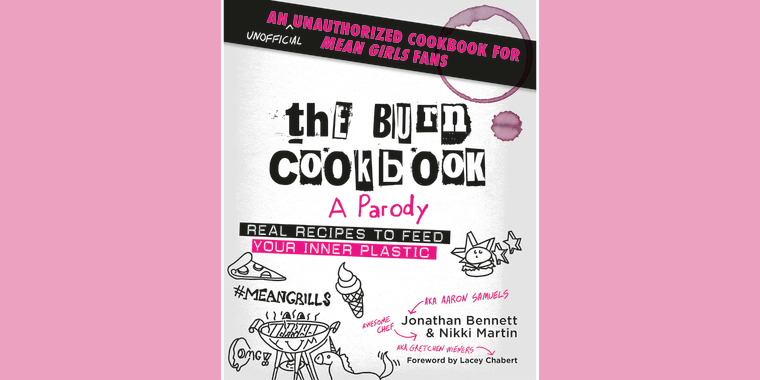 Jonathan Bennett created a 'Mean Girls' cookbook — and the recipes are so fetch! You go, Glenn (hot) Cocoa! You can sit with us. And eat with us, too! Fans of “Mean Girls” probably best remember Jonathan Bennett as Aaron Samuels, Lindsay Lohan's dreamy love interest in Tina Fey's hit comedy from 2004. Well, it turns out that Bennett hasn't quite left his Samuels' days in the dust because he just came out with a new cookbook inspired by the movie: “The Burn Cookbook: Real Recipes to Feed Your Inner Plastic." And, of course, the book's release date comes just before the most famous day in all of "Mean Girls" lore: Oct. 3. The cookbook includes recipes like "Fetch-uccine Alfredo," "You Go, Glenn (Hot) Cocoa," "Just Stab Cesar Salad" and "Are Buttermilk Pancakes a Carb?" It was co-written with "Food Network Star" finalist Nikki Martin. Bennett isn't exactly a newbie to the food scene, either, and currently appears on the Food Network as the host of "Cake Wars." But why write a cookbook now? "I did it because it's just fun and I want people to have a good time, get in the kitchen, start cooking with their friends and watch the movie and relive some of their favorite moments," Bennett told TODAY Food. But he was motivated in part by a deeply personal loss. "What really inspired [the book] was my mom was a chef and I grew up around cooking my whole life. I was always in the kitchen with her. I really immersed myself into this cooking space and really have fallen in love with it," Bennett said. "My mom passed away and she had all these recipes that were amazing ... I wanted to make sure those recipes didn't just disappear. I wanted to make sure that they lived on forever." Initially, Bennett said he wasn't sure how he would be able to incorporate his cooking experience on the Food Network with his mom's recipes until he was cooking with a friend about a year ago. "One day, I was in the kitchen with my friend and we were making guacamole and she [suggested putting] pomegranate seeds and I put apples in the guacamole and we tasted it and she goes,'Try this. It's not regular guac. It's cool guac, right?' I went, 'Whoa. What'd you just say?' and she goes,'It's not regular guac. It's cool guac'." Right then and there, the seed for a "Mean Girls"-inspired cookbook was born and Bennett came up with more clever recipe names. According to Bennett, some of the recipes are basically his mom's classics disguised with clever names. "We just were like, 'What are the things that the fans are going to read in the book and just laugh out loud and have a great time and have so many good memories of?'" He added, "So we came up with just some of the most hilarious ideas ever ... and that was the fun part of coming up with how can we take really famous quotes and favorite parts of the movie and turn them into food." The book also features another great movie tie-in: The foreword was written by actress Lacey Chabert, who played Gretchen Wieners. She even has a recipe in the book named after her character: "Gretchen’s Wieners.” Of course. As the host of "Cake Wars," Bennett said he really does like to cook, but he loves more than just baking. "I love grilling," he told TODAY. "I am a grill fanatic and we have [in the book] a whole chapter dedicated to it called Mean Grills!" Clever. Though he loves the versatility grilling offers, Bennett's favorite recipe from the book is based on his mom's chicken-stuffed shells, which he calls "the best things in the world." Appropriately, they're called "Aaron Samuel's Actual Mom's Stuffed Chicken Shells." It turns out that the cast actually bonded over food while filming the movie 15 years ago. "Lacey Chabert ... and Amanda Seyfried, who played Karen, actually cooked Thanksgiving dinner for our entire cast in the hotel in Toronto," Bennett shared. "They took over a hotel kitchen, between Amanda, Lacey and her mom. I think that was my favorite moment from the set of 'Mean Girls'... having Thanksgiving dinner together in a hotel room and Lacey and Amanda cooked it for us!" In addition to recipes, the book also features some behind-the-scenes stories Bennett recalls from filming. This unauthorized cookbook may have a silly name but the actor hopes it will resonate with fans of the original movie as well as strike a chord with new food lovers. "I wanted to bring the fans together because in the movie it's a lot about dividing each other and sitting at separate tables," explained Bennett, "and in this book [we made it] to bring people together." Bennett recommends watching the film while cooking a recipe, just to get into the true spirit of things. Plus, he added, the book's recipes aren't too complicated. "You don't have to be an expert cook to do this," he said. Pass the "Whatever, I'm Getting Cheese Fries," please!